with Clear Plastic Sleeves and Display Stakes. Use them over and over and save money for your charity or event. Print your own sponsor information on your personal printer and insert into sleeve its that easy. You can be as creative as you like. 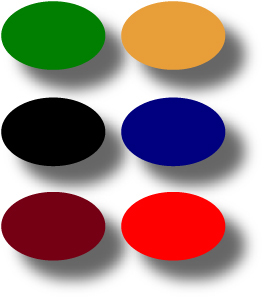 Print your sponsor names and logo’s in full color! 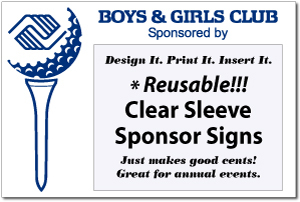 Q: Can the "Boys and Girls Club" signs be customized with our logo and organizations name? A: While we do not offer putting individual sponsor logos on the signs, we can add a tournament logo or company logo to each sign that is hosting the event. There is an additional charge to customize our stock golf signs. Please contact us at 972-771-1143 or at Jacob@signmart.com if you would like to customize.